Construction won't be complete until midway through 2019, but space is already filling up at a 25,000-square-foot commercial building going up in the heart of the Willamette area. 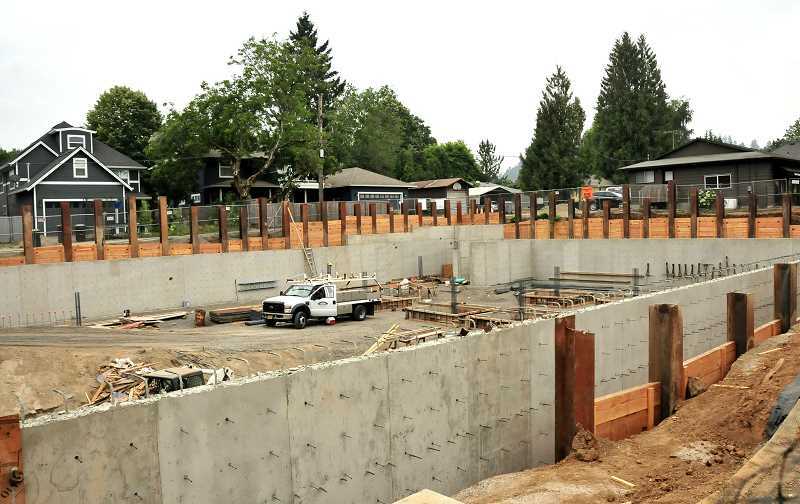 The development at 1969 Willamette Falls Drive is owned by Icon Construction & Development, which built many of the other commercial buildings in the area. According to Icon owner Mark Handris, the two-story building with underground parking is expected to open in June or July of 2019. "The parking garage is being installed (now)," Handris said. "It will probably be 30 or 45 days before the parking is up to street level, and then the framing on the building will be starting." The building was designed to house office and retail space as well as a restaurant. As of Aug. 20, Handris said about two-thirds of the second floor had been rented for office space, while around 30 percent of the first floor will be used for an Italian restaurant. "The rest is still available," Handris said. When the project was first announced in 2017, Icon planned to explore the possibility of using the 14,000-square-foot upper level for a 20-suite hotel. Ultimately, that idea wasn't feasible according to Handris. "There was not enough interest," he said. "The community would have appreciated it, but we could not find a hotel operator who could run a 20-suite hotel. They needed more — the economy wasn't there for it."